Johnson J, Jacob M (2010). Monitoring the effects of air pollution on forest condition in Europe: is crown defoliation an adequate indicator?. iForest 3: 86-88. Forest condition in Europe is monitored under the International Co-operative Program on Assessment and Monitoring of Air Pollution Effects on Forests (ICP Forests). The focus of the program is to provide an overview of the status of forest ecosystems in Europe with respect to air pollution and contribute to the understanding of the relationship between pollution and forest health. Crown condition parameters, i.e., defoliation and discoloration, are used as the principal indicators of forest condition within the ICP Forest network. 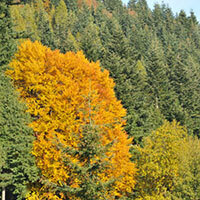 Crown condition assessments have been successful in disproving the “forest die-back” hypothesis. However, there are a number of limitations associated with this approach given the current monitoring objectives. Data from crown condition assessments indicate that stand age and country differences explain most of the variation in crown defoliation. It is difficult to clearly discern the effects of air pollution from other site and stress factors. The results do however indicate the role of meteorology and other factors. A better understanding of the relationships between forest condition and air pollution may be achieved if more specific, quantitative response variables are selected. However, we suggest that the original focus of the program on air pollution effects may need to be re-evaluated. Effects of land use, climate variation, and N deposition on N cycling and C storage in northern hardwood forests. Global Biogeochemical Cycles 11: 639-648. Intensive monitoring of forest ecosystems in Europe. Technical Report 2000, UNECE/EC, Geneva, Brussels, Belgium. Intensive monitoring of forest ecosystems in Europe. 1. Objectives, set-up and evaluation strategy. Forest Ecology and Management 174: 77-95. Neuartige Waldschäden? Ökologische Kritik an den Untersuchungsmethoden. Allgemeine Forstzeitschrift 796-797. Vegetation Mitteleuropas mit den Alpen: In ökologischer, dynamischer und historischer Sicht. Ulmer, Stuttgart, Germany. Potential and limitations of visual indices of tree condition. Chemosphere 36: 1031-1036. Design concepts adopted in long-term forest monitoring programs in Europe - problems for the future? The Science of the Total Environment 310: 171-178. The condition of forests in Europe, 2002 executive report. UN/ECE, Geneva, Brussels, Belgium. Forest condition in Europe, executive report. UNECE/EC, Geneva, Brussels. Monitoring of atmospheric deposition in European forests and an overview on its implication on forest condition. Applied Geochemistry 22: 1129-1139. Neuartige Waldschäden. In: Berlin-Brandenburgische Akademie der Wissenschaften, vol. 5, pp. 131-215. Long-term ecosystem research: why monitoring is so important. In: “Long-term ecosystem research: understanding the present to shape the future” (Kaennel Dobbertin M ed). Zurich (Switzerland), 7-11 Sept 2009. Forest decline. Progress in Physical Geography 16: 1-64. Forest health: its assessment and status. Commonwealth Agricultural Bureau, Wallingford, CT, USA. Vierzehn Jahre Waldschadensdiskussion - Szenarien und Fakten. Naturwissenschaftliche Rundschau 11: 419-430. Air pollution and forest decline in central Europe. Environmental Pollution 90: 171-180. Effects of environmental stress on forest crown condition in Europe. Part IV. Statistical analysis of relationships. Water Air and Soil Pollution 119: 387-420. Forest condition in Europe. 2003 Technical Report. UNECE/EC, Geneva, Brussels, Belgium. Übersicht über den Stand der Waldschadensforschung unter besonderer Berücksichtigung bodenkundlicher Forschungsansätze. In: Die Entwicklung der Waldschäden (Weiß J-P ed). Wilhelm-Münker-Stiftung, Siegen, 30: 36-60. Was macht eigentlich das Waldsterben? In: “Umweltgeschichte und Umweltzukunft - Zur gesellschaftlichen Relevanz einer jungen Disziplin” (Masius P, Sparenberg O, Sprenger J eds). Graduiertenkolleg Interdisziplinäre Umweltgeschichte, Universitätsverlag Göttingen, Germany. Integrative studies on forest ecosystem conditions. Multivariate evaluations on tree crown condition for two areas with distinct deposition gradients. UNECE/EC, Geneva, Brussels. Crown condition of Norway spruce in relation to sulphur and nitrogen deposition and soil properties in southeast Norway. Environmental Pollution 96: 19-27 -. Ökosystemare Wirkungsketten beim Wald- und Baumsterben. Forst- und Holzwirt 38: 468-474. The history and possible causes of forest decline in central Europe, with particular attention to the German situation. Environmental Reviews 3: 262-276. Ursachen des Waldsterbens in Mitteleuropa. Allgemeine Forstzeitschrift 45: 1365-1368. Environmental monitoring. CRC Press, Boca Raton, FL, USA.